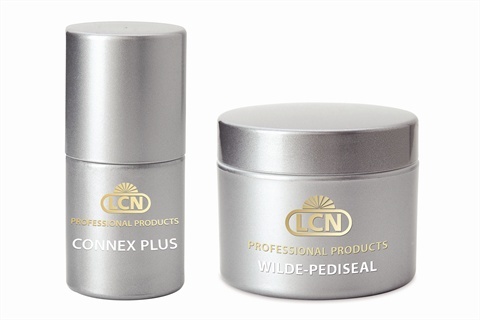 Barefoot by LCN is a light-curing pedicure resin designed to restore the toenail partially or completely while providing an attractive result. The resin has high flexibility to adjust to the movements of feet and toenails and is anti-mycotic to prevent fungal infections. Barefoot by LCN can be used to match any nail type and provide coverage on even the most unsightly nails. The resins are available in clear, pink, opaque, cool pink, natural beige, and pastel. 1. Buff and prepare the nail and wipe with cleaner. Be sure you have removed the shine. 2. Apply the bonding agent Connex Plus and let air dry for two minutes. 3. Apply a thin layer of Barefoot Resin and cure in the light for two minutes. Apply the French smile line with FM Pearl White or any white (or color) you desire. Cure for two minutes. 4. Apply a thin layer of Barefoot Clear and cure for two minutes. 5. Remove the dispersion layer with a swab and cleaner. Shape the nail with a hand file or an electric file if needed. Brush away any dust from filing with a dry swab or dust brush before applying Pedi Seal. 6. Apply a layer of Wilde-Pedi Seal (or any other LCN sealant) for a perfect shine. Cure for two minutes. 7. Remove the dispersion layer with a swab and cleaner. For more information, go to www.lcnusa.com.